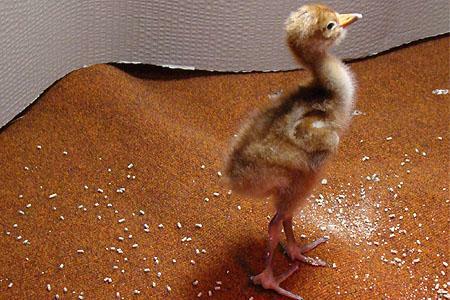 September 2012: At Slimbridge Willow developed the nickname 'the road runner', as he was incredibly active and often the first to explore. Although active, he was a shy bird, keeping himself to himself the majority of the time. As a youngster, he had a dark neck and a blonde top to his head. 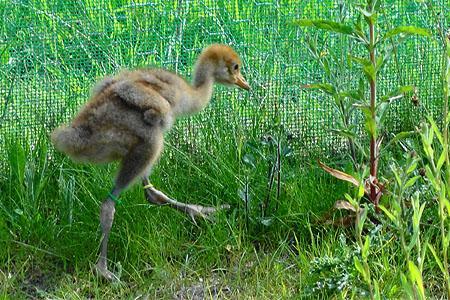 Once down in the Somerset release enclosure he integrated into the flock well and could be described as a 'good team player' - well, as good as cranes get, anyway. January 2013: As autumn turned to winter, the cranes began to flock together to look for food, which they found in plentiful supply in the form of maize left in fields from the harvest. All 48 have been spending most of their time either feeding in the maize stubble or on Stanmoor, completely unperturbed by the surrounding floodwater. January 2014: 2013 was a largely uneventful and quiet year for Willow. 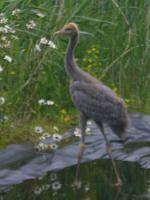 The spring and summer were spent largely on Aller Moor and West Sedgemoor, with the autumn spent feeding on the Stoke St. Gregory Ridge, and Stanmoor, and the winter flood period on pasture land on Stanmoor along with the majority of the other cranes. 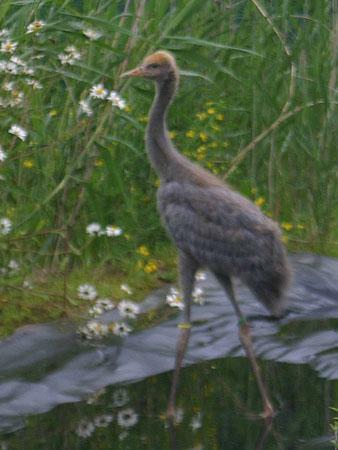 July 2015: In spring 2014, Willow was one of a group of 2012 cohort birds that flew up to Slimbridge and visited for a few days before returning for the rest of the summer on the Somerset Levels and Moors. However, in the late autumn he flew to Slimbridge along with Wendy – with which he appeared to be paired up. He spent the winter of 14/15 at Slimbridge seemingly paired with Wendy – and a breeding attempt was anticipated. However - Wendy was to form a pair-bond with Minnie in early Spring, leaving Willow to pair up with Sedge. Perhaps it all happened too quickly as no breeding attempt by this pair followed. February 2016: Willow remained at Slimbridge all summer and autumn apart from a few days back in Somerset in late October / early November. Perhaps he'll make a go of it this year with Sedge? ... time will tell. July 16: Willow was seen to associate with Wendy and her chick after the loss of Minnie last autumn but no known nesting attempt was made. Nov 17: Willow has not been seen since July 2016. 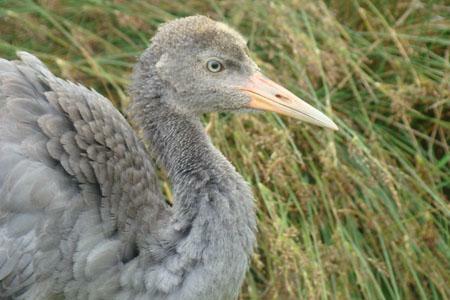 She is thought to have died whilst in moult at WWT Slimbridge.